One hour prior to events. 30 min prior to movies. Tickets may also be purchased by phone at 815-758-1225 or online. We accept cash, Visa, MasterCard, and Discover credit cards/debit cards. Checks made payable to the “Egyptian Theatre” with valid driver’s license are accepted. It is recommended that you purchase tickets in advance to secure better seating for reserved seating events. Advance purchase of tickets will also insure that you will not have to wait in line at the box office and potentially miss the start of the event you are attending. There are minimal convenience fees added to the purchase of tickets when tickets are purchased online or over the phone. Tickets purchased in person at the Egyptian Theatre box office do not incur any fees. Tickets purchased online or over the phone also have delivery options which may incur additional fees. All sales are final. No requests for cancellations or refunds are accepted. In the event that a performance is either cancelled or postponed, the Egyptian Theatre will make every effort to contact every patron via e-mail, time permitting. If a performance is playing multiple nights and tickets are still available we can exchange tickets after they have been purchased for a different night. Ticket exchanges are $5.00 per order. Refunds on tickets purchased are made for a cancelled or postponed event only. The theatre provides seating for persons that require ADA seating, with companion seating if necessary. Any patrons requiring special assistance should contact the box office in advance to make arrangements. The first floor bathrooms are ADA accessible. All ADA seating is on the first floor. Due to the historic nature of the Egyptian Theatre, built in 1929, there is no elevator to the mezzanine or balcony. The sidewalk underneath the marquee may be used for drop-off and pick-up. Handicapped parking spaces are available in the Van Buer Plaza parking lot located directly across the street from the theatre. Video cameras, monopods, tripods, audio recording devices and cameras with telephoto or zoom lenses, including SLR’s, are not permitted for most events at the Egyptian Theatre. For each event this decision is made by the producer or promoter typically because of strict copyright laws or for the safety of performers. This policy will be strictly enforced. Please check with the box office to see what is allowed for any specific event. The theatre does not allow concealed carry on any portion of theatre property. Only uniformed officers are allowed to carry on theatre property. If your tickets are to be mailed, you should receive them within a reasonable amount of time, generally 7 to 10 business days. If you do not, please contact the Egyptian Theatre – no later than 24 hours before the day of a performance to insure proper attention. If your tickets are to be emailed, you should receive the email moments after the transaction has been processed. To utilize mobile tickets, you must have a smart phone with the capability to access your email. There is a link provided in the email that contains your tickets. Tickets will be scanned directly from the cell phone. These tickets can also be emailed individually to others in your group, once you have received the email. If you do not receive an email from the Egyptian Theatre Box Office, please contact no later than 24 hours before the day of a performance to insure proper attention. If your tickets are to be emailed, you should receive the email moments after the transaction has been processed. There is a link provided in the email that you will click to open your tickets. Once you have opened the link, your tickets will appear and you will be able to print them. These are what you will bring with you the day of the show. 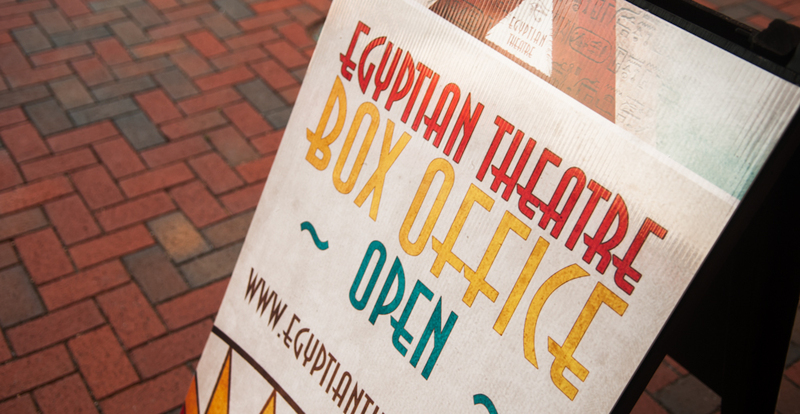 If you do not receive an email from the Egyptian Theatre Box Office, please contact no later than 24 hours before the day of a performance to insure proper attention. The Egyptian Theatre can only provide customer care, and service, for tickets purchased through the Egyptian Theatre or its affiliates. Tickets that have been purchased via resale cannot be guaranteed. The following items are not permitted entry into the Egyptian Theatre. Such items will be asked to be disposed of or returned to the vehicle. Suitcases, coolers, or backpacks with or without wheels. Coolers required for medication may be stored at the concession stand. Wheeled mobility devices with less than 3 wheels and devices that cannot maintain stability and balance when stopped, powered off, or unoccupied. Training wheels or similar modifications are not permitted. Large costumes that would impeded the comfort or sight-lines of other patrons, any mask or hood covering the face of an individual. If your tickets are to be “held at will call”, they will be at the venue Will Call table at the time of the performance. The box office is open no later than 60 minutes before an event. It would be helpful if you can arrive early to allow for parking and to avoid the last minute rush. You MUST have a photo ID or the credit card you used to purchase the tickets in order to pick them up. The signor of the credit card used for the purchase will be required to sign for the tickets in order to pick them up.